Today is Tuesday of the 4th Week of Lent. Laetare still echoes in our ears, but in the ancient Church the catechumens and the baptized, this week, began their strict penance in earnest. How are you doing with your Lent? Go to confession! Augustine talks about dung, and where it belongs. 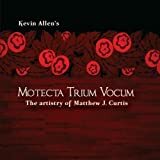 In these podcasts I sometimes use snips from this lovely disc of music: Motecta Trium Vocum. Beautiful. This entry was posted in LENTCAzT, PODCAzT and tagged Augustine of Hippo, LENT, LENTCAzT, podcast, PODCAzT. Bookmark the permalink.